I will apologize up front for the lack of coherency, brevity and self-indulgence of this post. I am also going to be purposefully vague because I feel that the ideas I am sharing don’t need any specific trigger and are applicable to most experiences we have. This week has proven to be challenging on multiple levels and with those challenges, the need to surrender has been a constant reminder. We all face those situations over which we have little control and this feeling in and of itself makes us struggle all the more to restore our point of dominance. Mundane experiences bring a sense of physicality to this struggle; with outcomes and actions eventually manifesting into something we can concretely see, feel, touch and understand. Adding a spiritual level to the equation is a less tangible process. The changes that occur and often the places of conflict are not so concrete. The results are like tiny droplets of rain, that with slow and steady accumulation eventually come to an overflowing point, but the boundaries for that overflow are often ill defined and unnoticed. The usual strategies I have for keeping myself afloat were useless and the more antsy I became about my responses the more over reactive I felt. I have spent a good portion of my lifetime using meditation and visualization as tools to remain in control of my responses; never allowing too much of my emotional nature to “get in the way” of my rationale. The realization was that those responses needed the buoyancy of watery emotions to get me to relax into a place of surrender. We are conditioned to believe that to surrender is to be weak. We are told that you must keep fighting and exerting your will to affect change. We resist and resist until we are weary from the misplaced effort and caught in a tighter webbing of confusion than when we began. The interesting by-product of this resistance is the rationale we develop around why we need to keep plugging away and prodding forward. The truth in this is that to fully surrender implies that you will allow yourself the space to honor the emotions that overflow and then, creatively problem solve for solutions. To surrender means taking a deep breath, trusting the waters of emotion will carry you and then begin the forward momentum of thinking everything through from a more flexible and less reactive perspective. And, so I struggled this week moving through the full gamut of sadness, guilt, indifference and anger; until weary from the fight I broke down and had a good cry of release. In that moment, I laid back into those healing tears and felt the loosening of my rigidity and more expansive. 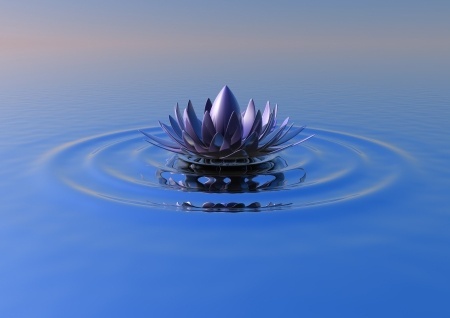 The tension flowed into those waters and I felt a deeper opening like the petals of a flower, exposing, yet protecting the center core from which all the petals extend out and draw their nourishment and viability. Some of the challenges still are unresolved, but they seem a bit less daunting in their ultimate resolution. I’ve surrendered into a space of seeing more clearly and problem solving more productively, knowing that the changes and added responsibilities that are coming will be met by a strong yet pliable response.